Warframe gave us space ninjas in 2013, a sizeable technological advance on 17th century Japan, and now they’ve gone and got jetpacks in the upcoming Archwing update. Which, by my maths, makes them about 18,027 times better. Yes, Archwing’s going to let you fly around in deep space, dispensing ninja justice to robots and evil spaceships-alike. And for free. Before we get into the update it’s important to know how much Warframe has changed since the game that first launched back in March, 2013. 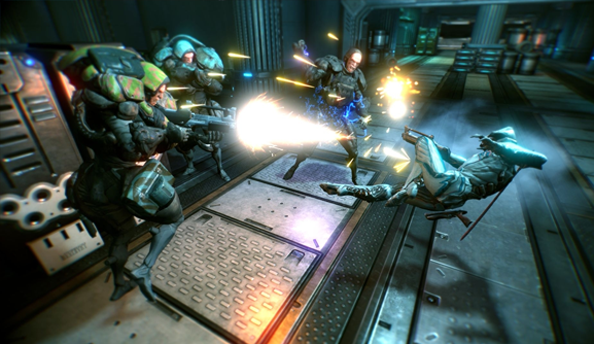 Warframe started life as 4-player co-op game with strong Left 4 Dead vibes. You weren’t zombie apocalypse survivors but space ninjas, and instead of fighting zombies you fought robots and cyborgs. Despite only having one level, Warframe had a lot of life in it: every time you played its architecture shifted about and the enemies changed location to suit. Your runs of the futuristic space station filled your boots with XP and loot that you could spend to unlock new abilities and kit for your warframe exoskeleton. Still, Tim wasn’t impressed. He found the changing levels lacked direction and the action became confusing with added players. Much has changed since then. 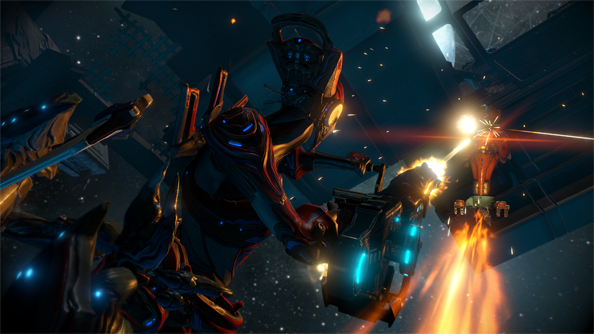 Digital Extremes have kept Warframe alive by constantly iterating on its content and systems. It began life with one level tileset and four warframes. It’s now got nine levels, spanning space stations, to jungles, to abandoned cities and 20 different warframes all with their own ability sets to unlock. Levels are now constructed more intelligently and the team rebuilt the core combat systems to make melee slicing and dicing look and feel better. Now that sword hits and combat have more impact it’s easier to follow the action. A new metagame ties your matches into something larger so you don’t feel like each mission is a disconnected brawl with the AI. You can now build a clan dojo and and you have your own spaceship which you visit between missions. You’re no longer just repeatedly thrown into the same procedural level soup and, instead, pick missions and interact with other players outside of the gun battles. Digital Extremes have also added tamagotchis to the space ninja fracas. While exploring Earth’s jungle wastes you can come across big eggs that, if cared for, will hatch into dogs (it’s the future so egg-dogs are definitely a legit thing). You feed it and care for it and once it matures you can take it on missions to tear out evil-doers throats. Just like you did in the 90s with Bandai’s pocket pet. Which brings us to Archwing, Warframe’s next big update: deep space flight and space station trench runs made to evoke memories of attacks on the Death Star. Until now your battles in Warframe have been contained within space stations and the Earth’s surface. The Archwing update throws you out of an airlock into the maelstrom of an asteroid field populated by big, evil space robots with a pair of rockets strapped to your back. You don’t have long to admire the scenery because the enemy ship that’s commanding everything will start firing its laser cannons at you almost immediately. Archwing isn’t on rails so you’ll have to dodge behind the asteroids that litter the space between your ship and the big bad’s to last long enough to reach the ship. On the way to its Eye of Sauron-like laser you have to contend with smaller drones that are scanning the asteroid field, dodging the clusters of heat seeking rockets it’s firing at you, and avoiding the forcefields being erected to slow you down. While Archwing’s a bit David and Goliath, Digital Extremes aren’t throwing you out there with just a sling. 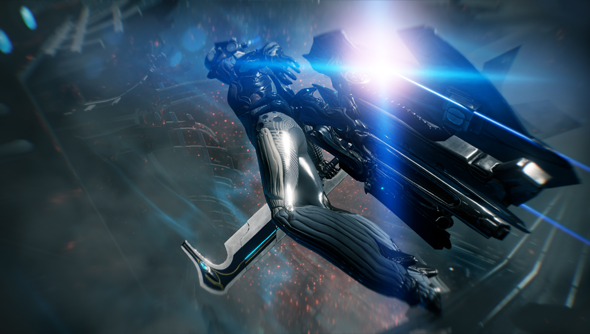 As well as two new primary weapons and two new melee weapons, each archwing has four abilities. There’s a directional shield you can use to force your way through the enemies’ barrage, a missile countermeasure you can use to negate incoming swarms of ordnance, a missile system of your own to take out clusters of enemies, and a stasis bubble. You can drop the bubble to create a pocket of slow time. The bubble’s essential for crowd control, freezing one group of foes in place to give you some breathing space. Digital Extremes don’t let you use the gear you’ve unlocked in the vanilla game, which is a shame because some players will have been collecting it for more than two years. Instead, in space, you can only use the gear and abilities that come in Archwing. However, with more archwings and loot planned, in time there will be enough variety that it shouldn’t matter. There’s going to be six different modes to play at launch. Free space is what we were shown, a large open level where you need to work your way to the enemy ship. There’s the Star Wars-inspired Trench Run mode. That has you approach the target ship by moving up the hull of another, flying through its trenches to dodge the missile fire overhead. And then there are the wave-based game modes – Exterminate, Defense, Interception, and Sabotage. I’ve not played Warframe since it first released back in March, 2013 but Archwing looks like a great time to start again. There’s all the updates that have come since launch and then there’s the chance to fly around in space fighting robots like I was born to do. It helps, too, that Warframe is free-to-play on Steam and Archwing is a free update. Warframe Archwing’s release date still hasn’t been announced but it’s likely to be by the end of this month.